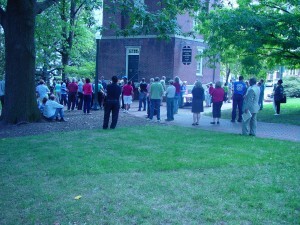 Acorn Holds AstroTurf Rally In Richmond VA | Virginia Right! ACORN, the infamous group of community organizers that are under investigation in several states for voter fraud decided to hold a rally at the Capitol in Richmond, Va at 5:00 PM today. I arrived about 20 minutes before 5:00 PM, camera in hand and had to strain to find the small cluster of people around a table where they were passing out pre-printed signs from cardboard boxes for the few who had gathered to hold up. A couple of people had prepared hand made signs and I overheard one of the Capitol Police Officers telling the small group that sticks were not allowed on the signs. They could be used as weapons. I assume they had also seen the crazy liberals that are starting fights. Good for them! There were only about a dozen people gathered about 15 minutes before the 5:00 PM start time, and I began wondering, what if Acorn held a rally and nobody showed. Well, Acorn had thought of that, too. 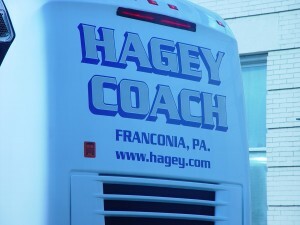 About 10 minutes before the event started, a very nice bus owned by Hagey Coach of Franconia, Pennsylvania, a small town just outside of Union stronghold Philadelphia. Interestingly, none of these folks went over to the table where you could sign up for Acorn duty, sign a Health Care petition, or get a sign. They already had their signs, which they brought with them from the bus. Noticed at least one Union shirt that said Richmond IBEW, but didn’t notice if he got off the bus or not. The bus crowd moved directly in front of the TV cameras, which was odd, because the camera was off to the side. Seems they had been instructed to seek out the cameras and cluster to make it look like a larger rent a mob. The next time Nancy Pelosi wants to talk “rent-a-mob” refer her to these pictures. In leaving, I took the long way past the beautiful coach that brought the fake mob and I swear I could smell the faint aroma of a Philly Cheese Steak. You know, that’s one thing you just can’t get in Richmond. A good Cheese Steak. So, if they did not sign the petition, they are likely not from VA. This seems obvious, based on the bus company, but you cannot assume. Did you find out where they were from? Do you know who pays for these buses? I was trying to be inconspicuous. The last thing I wanted to do was let them know who I was and what I was doing. I really prefer to not to be one of the thugs Pelosi screeches about. Low profile was the better opion this time.